Reduce the spread mosquito-borne diseases by eliminating mosquito breeding habitats, and by dumping standing water around your property. 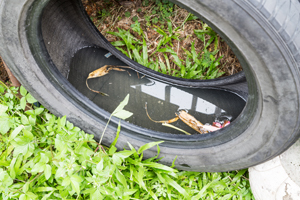 In areas where water cannot be dumped, apply larvicide to keep the mosquito larvae from developing into flying mosquitoes that can bite. Some mosquitoes breed indoors and outdoors and bite anytime of the day or night. Mosquitoes can breed in small amounts of water that collect in containers like bottles, cans, cups, buckets, hoses, planters, drains and in plants such as bromeliads. 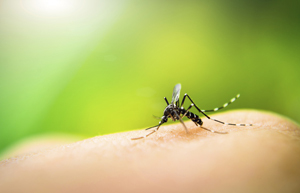 The life cycle of mosquitoes is approximately seven days, so you should implement a regular routine to inspect your property for breeding habitats, dump standing water, and cover any areas that could collect standing water, especially after it rains. Place larvicide into bromeliads and any containers that cannot be dumped every two to three days. Larvicide products last between seven and 60 days, depending upon the product type. These products are available online, at local home improvement and hardware stores, and wherever pest control products are sold. Check the product labels for specifics regarding the type of habitat for which they are most suitable, and the duration of effectiveness. Products are in the form of either briquettes, tablets or granules that contain either Spinosad or Bti, natural larvicides that are safe for pets, birds, beneficial insects and the ecosystem. Some brand names of Spinosad or Bti larvicides are Natular G, DT and XRT, MosquitoDunks®, Mosquito Bits® and Bonide Mosquito Beater®. please contact the Broward County Mosquito Control Division at 954-765-4062.